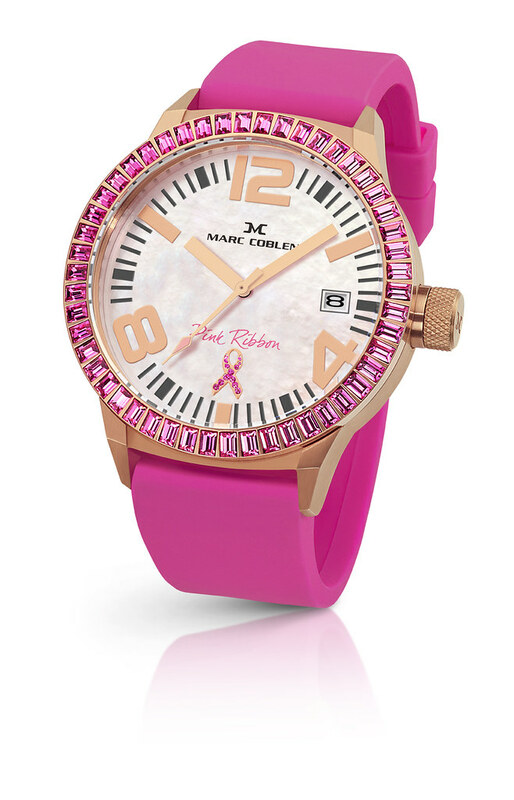 Marc Coblen's Pink Ribbon Watch To Raise Breast Cancer Awareness. October is Breast Cancer Awareness Month and we usually have fun runs, concerts, charity auctions, and medical missions to help facilitate check-ups and treatments for women who have breast cancer. However, according to the Philippine Cancer Society, a staggering percentage of Filipinas have a difficult time paying for their treatment, while others are too nervous to continue with theirs. This is where Marc Coblen, a Dutch brand created by Jordy Cobelens, the same founder of the well-known timepiece TW Steel (read my blog post about TW Steel), comes in to create a change – and a fashionable one at that. In line with the Breast Cancer Awareness program, Marc Coblen has collaborated with the Philippine Cancer Society’s Best Dressed Women of the Philippines and Lucerne, to create a special edition watch called the "Pink Ribbon Watch". The Pink Ribbon Watch showcases a 48mm pink Mother of Pearl face with a small Swarovski encrusted pink ribbon. The watch is encased in a Rose Gold finish steel case with pink baguette Swarovski crystals on its interchangeable bezel and uses a pink silicon interchangeable strap with a rose gold clasp. In light of the partnership, all purchases will entitle the cardholder to a white leather strap and a rose gold finish bezel inside a beautiful white leather watch box. The special edition Marc Coblen Pink Ribbon Watch is exclusive to MASTERCARD holders and will retail at Php 15,000. A generous portion of the proceeds of all Pink Ribbon Watch sales will be donated to the efforts and activities of the Philippine Cancer Society in providing consultation and treatment to women with breast cancer all over the country. that watch is cuuuute!!! what a very nice way to show support for breast cancer awareness. having the right attitude is definitely the way to go when it comes to beating cancer.